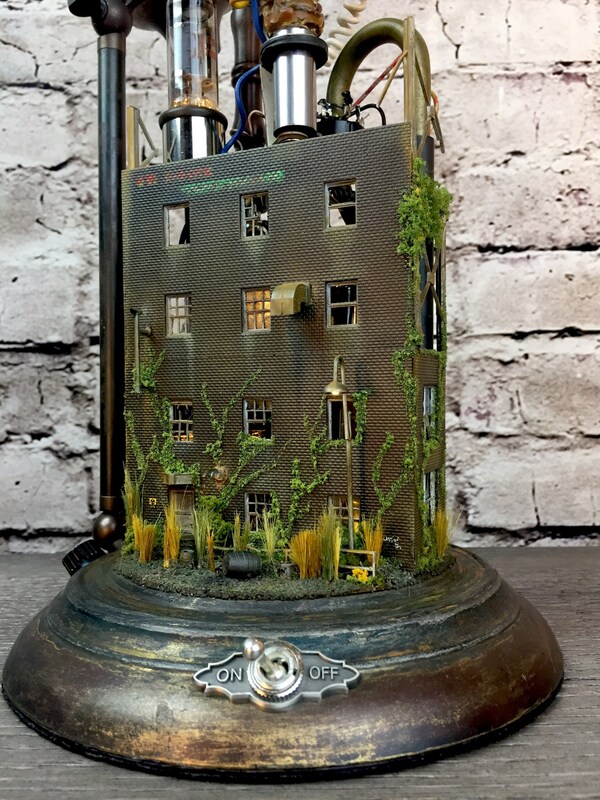 This newest bit of assemblage is inspired by a few of my favorite Instagram photographers that make romance out of abandoned, forgotten and neglected things and places. I wanted to capture this feeling under glass, pairing it with other often hidden obsolete items and illuminating it all with futuristic (and current) LEDs. 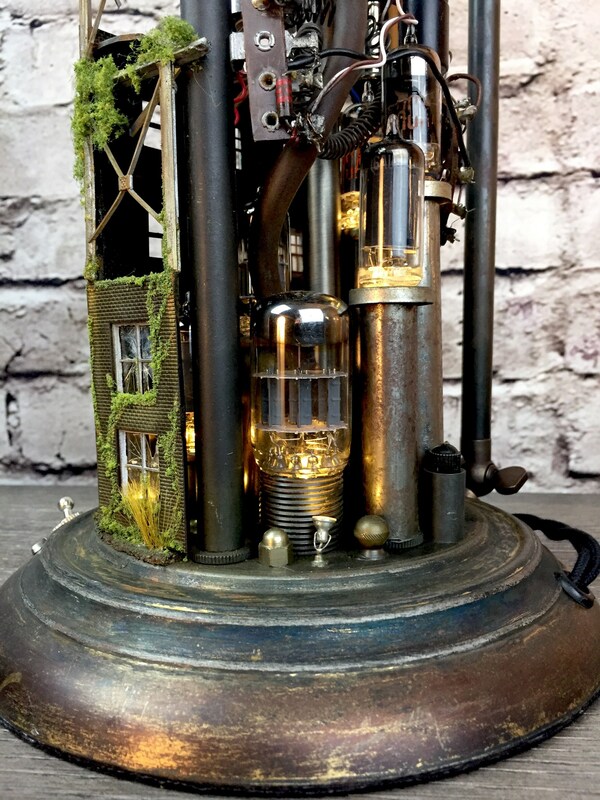 This steampunk inspired creation is the amalgamation of many different found objects from my immense collection of odds and ends. 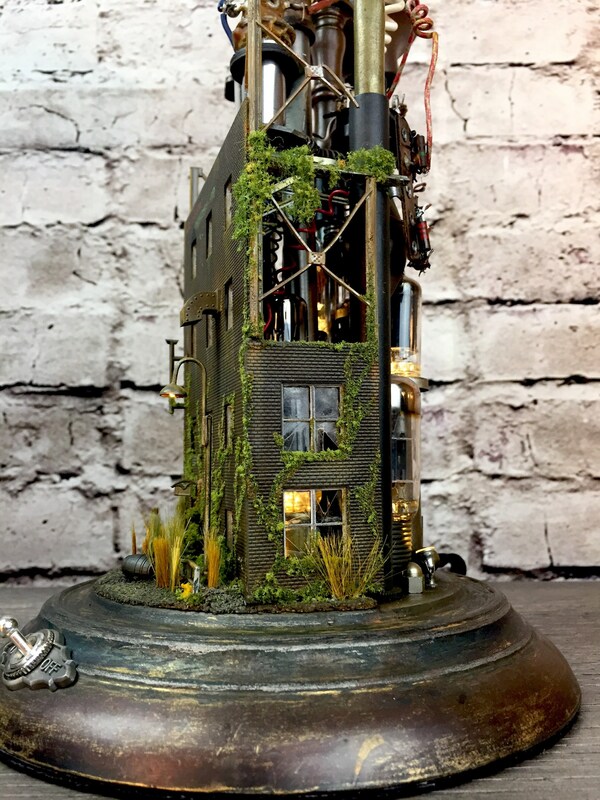 Inspired by real places, I've hand created a diorama of a forgotten factory/warehouse. 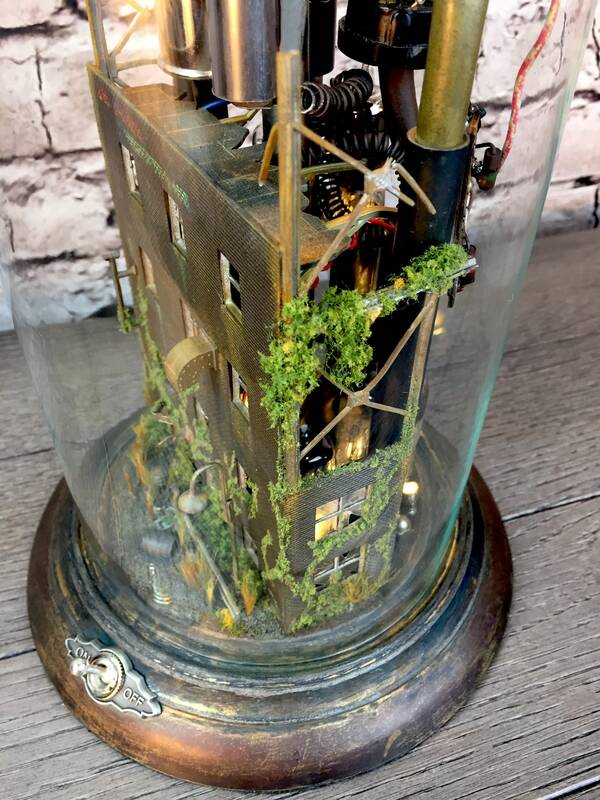 These pieces and parts are secured to the base and have been carefully assembled to provide a miniature world under glass. There's broken "glass" in some windows, but most are open to permit one to view the tubes and other illuminated pieces in the dark. 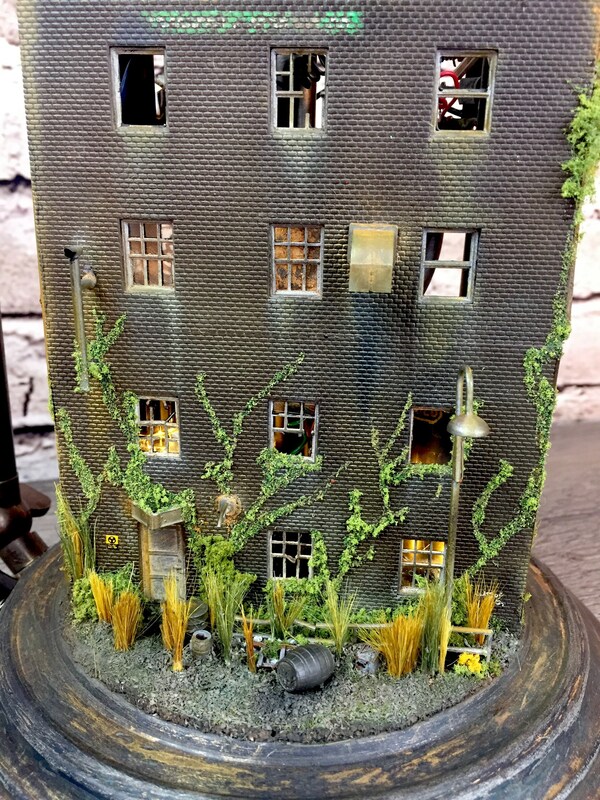 The street lamp within the diorama is an LED and does illuminate with the tubes. 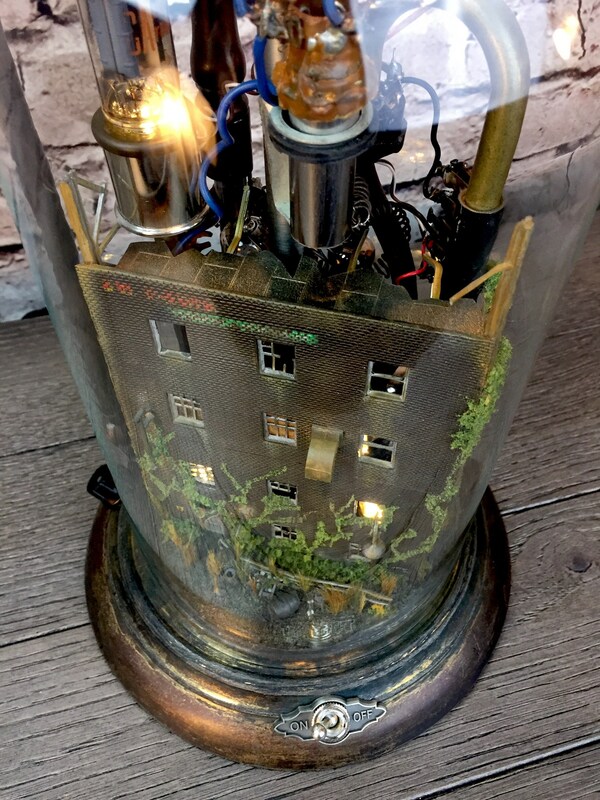 Behind the diorama are vintage radio tubes and other curious vintage artifacts illuminated by LEDs. These 12 volt LEDs are controlled by the on/off switch mounted in the base outside the glass dome. There are 10 illuminated tubes, 5 micro-spotlights and a micro LED street lamp fronting the old factory. DOWNLIGHT: There is a warm white LED installed in the cone which hangs over the dome. 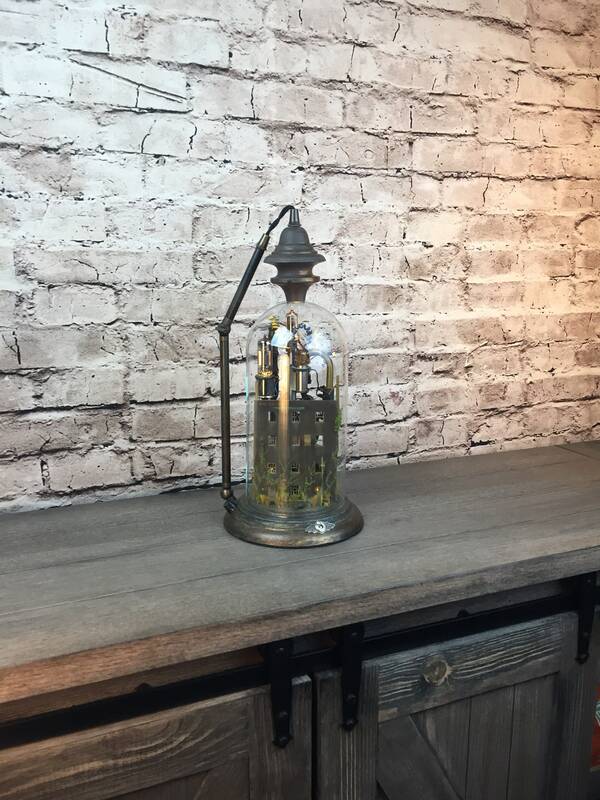 This LED is controlled by a separate switch and serves to further illuminate and highlight the interesting bits of vintage history and can be used with or without turning on the lights inside the dome. It provides a great way to view the diorama in the dark. SPECIAL NOTE: Absolutely NONE of the wires/connections which are visible in the creation are powered. ALL ELECTRICAL (including the transformer) is safely connected and housed inside the base. This creation is about the ILLUSION of a working "contraption" and is not dangerous to touch. Everything is fixed into place and is not designed/meant to move. Beautiful and interesting details are safely stored under glass. 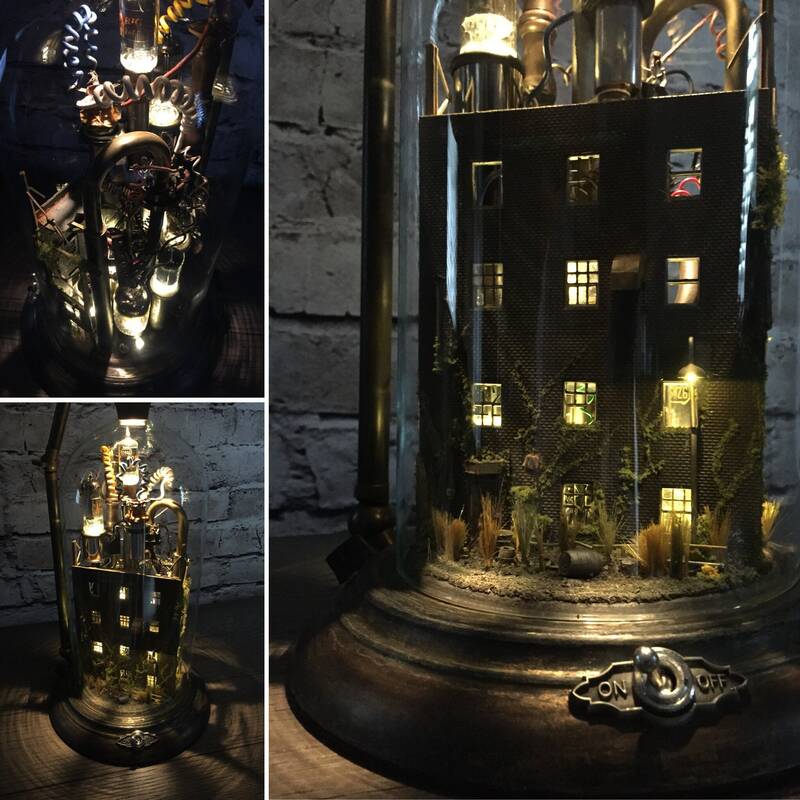 Great details in a lighted space, incredible ambiance in the dark. SIx feet of twisted fabric covered wire connect the lamp to the nearest outlet. Approximately 17.5"H on a 7.5"base. All bulbs are included. LED lights are locked in place and will provide years (50,000 hours each) maintenance free use. 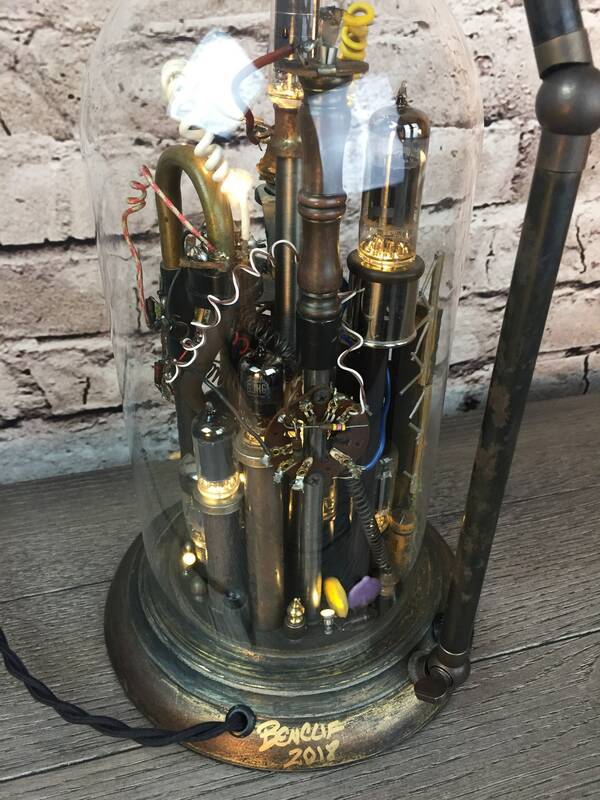 All parts (except electrical) are genuine antique and/or vintage. THIS PRODUCT REQUIRES A SIGNATURE AT TIME OF DELIVERY. SHIPPING: FedEx. Please provide a phone number with your order. I accept PayPal, and Credit Card payments. Sales Tax is only applicable to those sales within the state of Georgia. Sales tax is not applicable to any other state. I am happy to reserve a product for you in you need extra time and want to hold a product. I require clear communication of your intent and without it, will only RESERVE an item for 24 hours. ANY RESERVATION BEYOND 24 HOURS requires a non-refundable deposit of 1/4 the item total. Convo me to make arrangements. Due to the nature of my creations I will need a few extra days to package your purchase for shipment. Simpler creations will leave my studio faster than those that are larger or have an unusual shape or form. I reuse shipping materials whenever possible, this includes boxes and dunnage. It's a small thing, but it does reduce shipping costs and lessen my impact on the environment. **CHANGES AS OF APRIL 2013: We are now shipping exclusively FedEx. Under special circumstances I may also use insured USPS Parcel Select or Priority Mail. If you need your purchase sooner, please use the Conversation button at the top of this page so we can make arrangements in advance. Keeping shipping costs low is a priority. PURCHASES IN EXCESS OF 250.00 REQUIRE A SIGNATURE AT TIME OF DELIVERY. PLEASE BE AWARE SO SOMEONE IS PRESENT TO SIGN. If you'd like to purchase more than one item, I will combine shipping if the items can be safely shipped in the same carton. I will refund any overpayment directly to your account on the day of shipping. Currently I am only shipping within the United States. We put in extra effort in both describing, providing measurements and photographs of any and all parts of a creation that may influence a buying decision. We are open to questions and will provide additional information to aid in your decision. For this reason, we accept returns within THREE (3) days of purchase on our one of a kind creations. Please be certain your questions are sufficiently answered before you make your decision. We strictly adhere to this return policy. Please be aware. All lighting is pre-tested before it leaves the studio to ensure it is in working order. We will do whatever is economically and physically feasible to help you with a concern. Please make contact. SHIPPING CHARGES ARE NOT REFUNDED. COSTS RELATED TO SHIPPING THE ITEM BACK ARE THE BUYER'S RESPONSIBILITY. I will insure all items prior to shipping to cover both the buyer and seller in the event of shipping damage. My creations are often one-of-a-kind and may not be replaceable. We will handle this on a case by case basis. Contact me immediately so we may discuss the damage and how best to repair it or simply offer a full refund. YOUR COMPLETE SATISFACTION IS TOP PRIORITY. 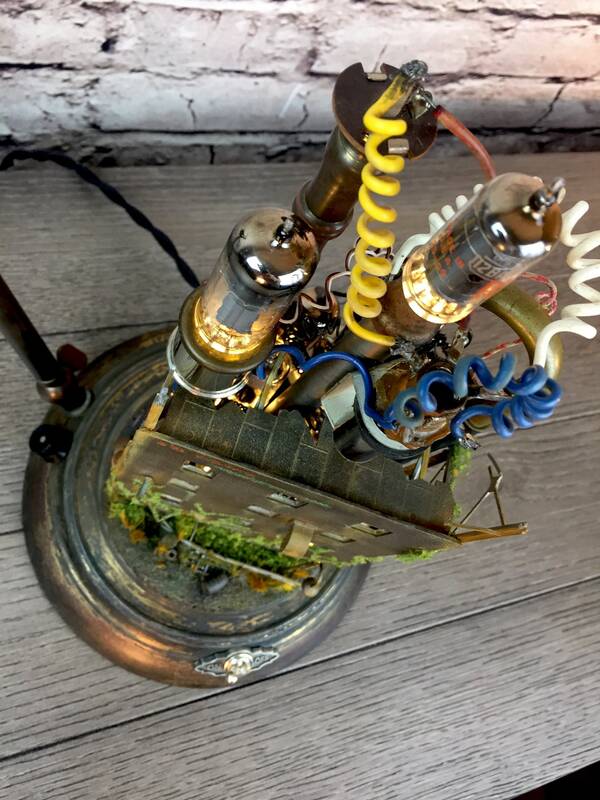 These are one of a kind lamp creations made from repurposed, recycled, upcycled materials. There may be finish imperfections and other marks that are inherent to the item when it was found. Typically, the only new materials I use are switches, sockets, bulbs and wire. WHOLESALE: My Etsy prices are already wholesale. I do not offer further discounted pricing or lists. Nearly all of my creations are one of a kind, allowing you to price them according to the customer demographic of your store. If you'd like to discuss an particular item, please convo me via Etsy.